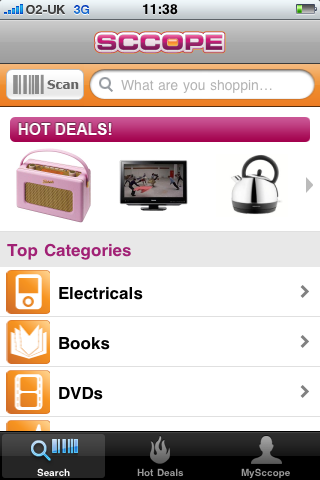 One of the better mobile shopping comparison services I have seen so far is Sccope, which launched a mobile site in February 2009. The new app, which is £1.19 to download, has been doing well in the App Store since its release last week. It is currently top of the paid app charts, and third in the highest grossing list, thanks in part to a mention in The Sun over the weekend. The app is simple to use; you can either browse by category and sub-category from the homepage, type in a search term, or use the barcode scanner. This is the third barcode scanner I’ve tried out on the iPhone (I have a plain old 3G with inferior camera) and it is the easiest to use. If you have found the product you want, you have the option of going to the retailer’s online store to purchase the item, and this is an area that, should mobile comparison apps and sites like this one become more popular (and there is every indication that they will) where retailers that have developed mobile websites have a distinct advantage. This is because mobile optimised sites make it far easier for the user to see more details, review, and actually complete the purchase. Thanks to the various elements on the page, it takes longer to load up, and it’s clear from the screenshot that there is plenty of zooming and scrolling needed to read the text and navigate from the product page to the checkout. Text is easy to read, further product details are there, and the call to action is unmissable. Furthermore, the whole shopping basket and checkout process has been designed for the iPhone, so a purchase can be made with far less hassle required than through a non-mobile site. Since consumers can see details and complete their purchases much more easily on a mobile optimised website, then the retailers that have catered for mobile users are best positioned to get more sales from consumers using price comparison services like Sccope. The new Sccope app is the best mobile comparison site I have seen so far. For each of the books, DVDs and games I scanned I found plenty of useful results from a good selection of retailers. Crucially, the barcode scanner works very well, which takes a lot of the pain out of the process, meaning you don’t have to spend time typing in search terms or browsing through the various categories. It seems to be popular with users so far too, with an average of four stars on the App Store from 197 reviews, the main gripes being the lack of products in some areas, and the fact that iPod Touch users cannot use the barcode scanner. How best to celebrate the first anniversary of the Obama administration? Why, with an app, of course – and a mobile web site, to boot.